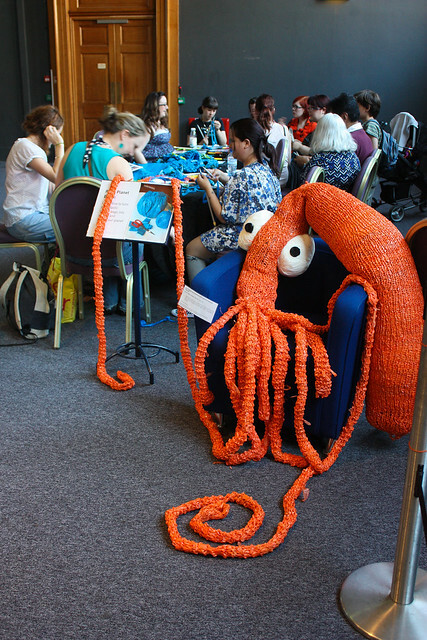 Want to win an ever-so-cute amigurumi octopus? A handknitted pair of TARDIS socks? 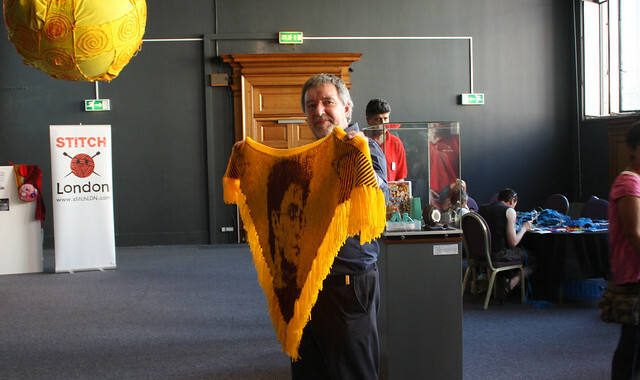 A one-off exclusive by an infamous graffiti knitters? Well, you’re in luck and it’s all for the Sport Relief Charity too! Since quite a few Stitch Londoner’s are taking part in this project we thought we would post about it here too. 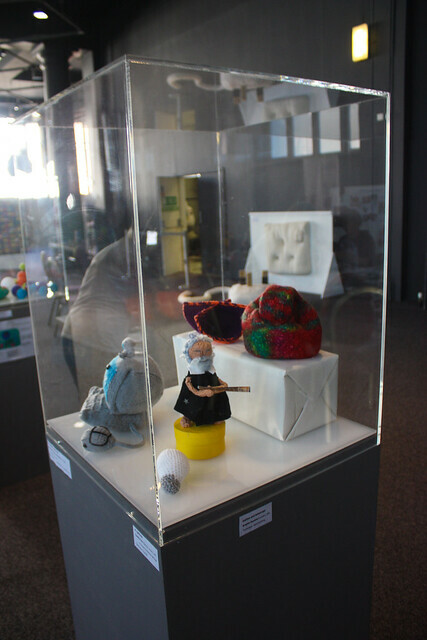 Teen Granny Scarlett F Curtis’s Knit Relief project is offering 53 brilliant bits of handmade fabulousness to raise money for charity. Up for grabs is also an exclusive Whodunnknit, handmade Little My in an exclusive Whodunnknit presentation box with an exclusive set of graffiti knitting badges too. That’s three exclusives right there. 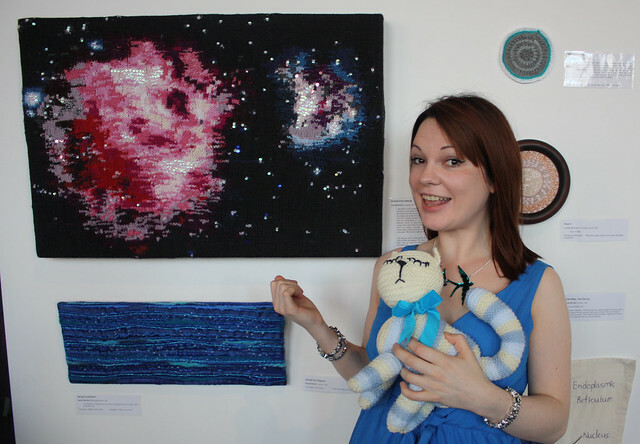 Check out all 53 of the Knit Relief makes here and give to get a heavenly bit of handmade. 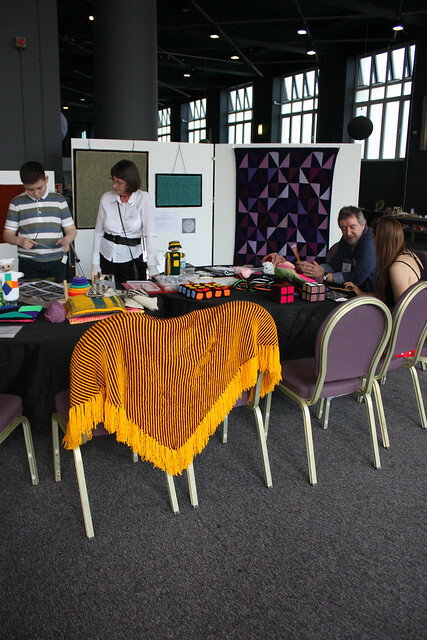 Remember back in 2010 when 255 of you made Stitched Selves and we showed them off at the Science Museum for one night only? Since then they’ve been busy. 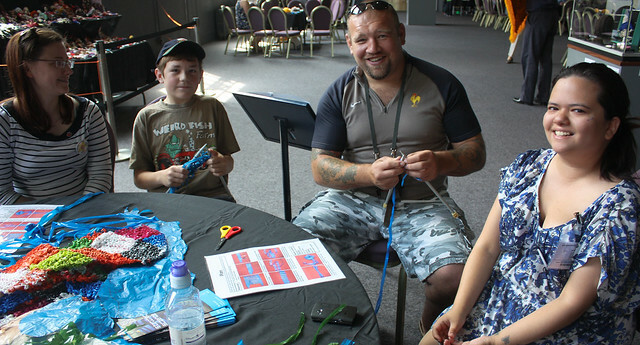 They made an appearance at our Stitched Science event last summer and now they’re going to be on the big screen! Squeeeeeeeeeeeeeee! 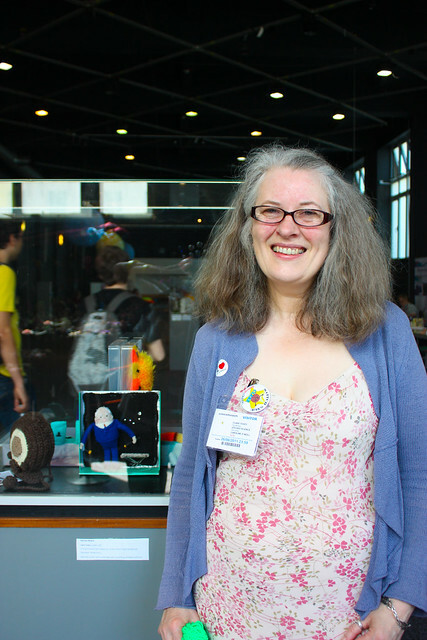 The lovely folks at the Craft Club (the Craft Council’s initiative to get more people passing on the love of craft) got in touch to ask if we had any inspiring handmade bits to star in their brand new crafty film. Of course we did! 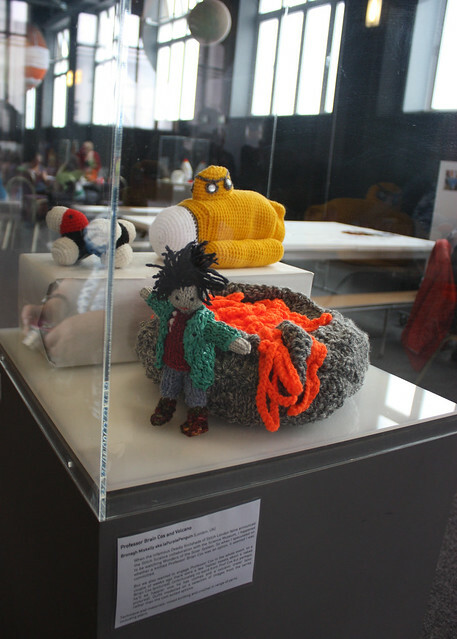 Your Stitched Selves were possibly the most inspiring project we have ever done. 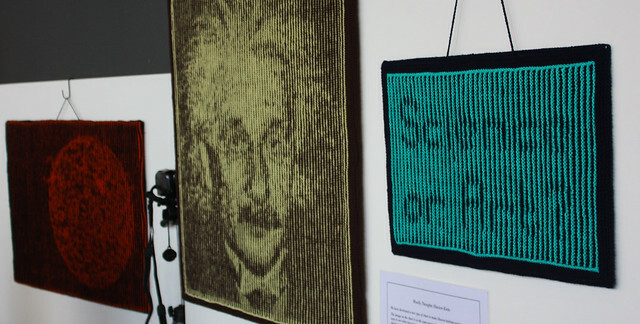 So where can you see this fibre-filled film? Well you’re lucky enough to be invited to the premiere at Stratford East Picturehouse, East London. The FREE event takes place on Saturday 25th Feb 2012 between 12.00-13.00. You can book free tickets here. 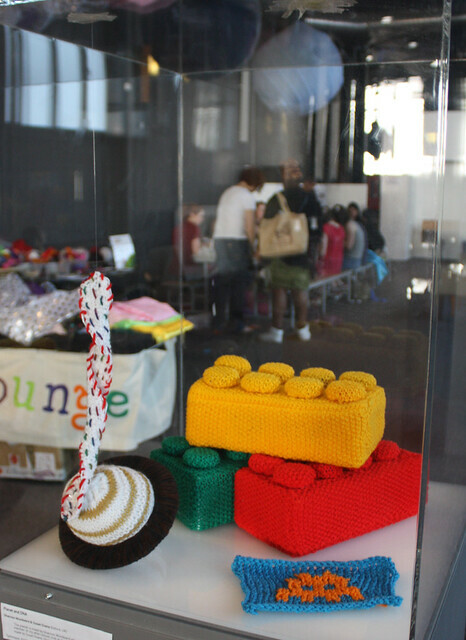 There’ll also be a whole load of knitting going on, including free finger-knitting lessons and starter knitting kits. 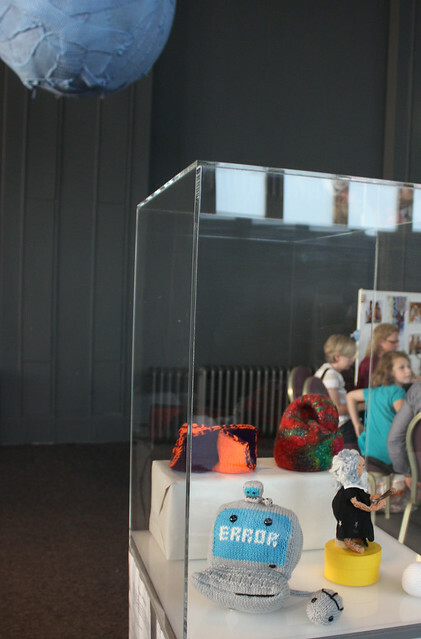 All ages are invited so join the Cinema Knit-along with Craft Club and come and see if your Stitched Self made it onto the silver screen! If you can’t make it along the film will be online very soon! We’ll post up a link as soon as it is. There are also more pictures over on our Facebook page. See you there, Stitch Londoners. It’s official. 2012 will be the year of the Stitch! This year Stitch London plans to cram as much stitching in as possible and we’re starting as we mean to go on with our fantabulous GIANT NEW YEAR NEWBIES STITCH UP! 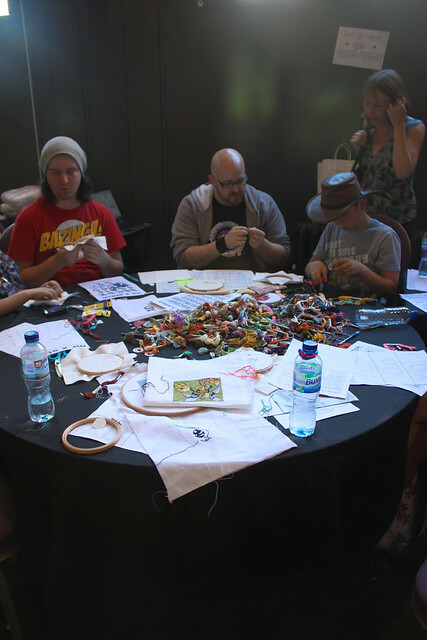 Every year we gather as many stitchers as we can at our second home, London’s Royal Festival Hall, to get our public stitch on in style. 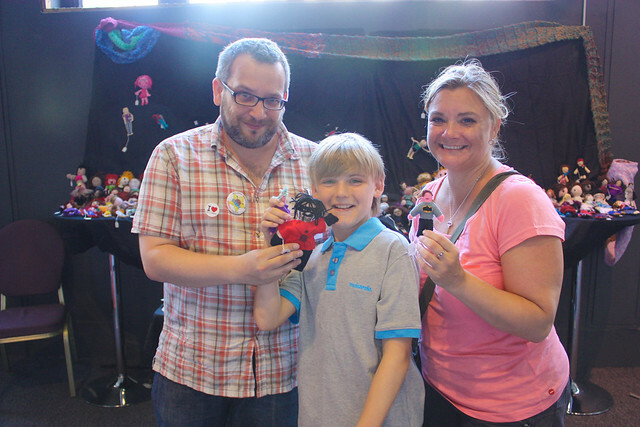 Each year we see around 200 proud crafty people gather. Celebrate Stitch London’s 6th Birthday! This year we’re turning 6 years old! To celebrate we’ll have some spot prizes which will be given out randomly throughout the evening. Woo hoo! STITCH LONDON NEEDS YOU! 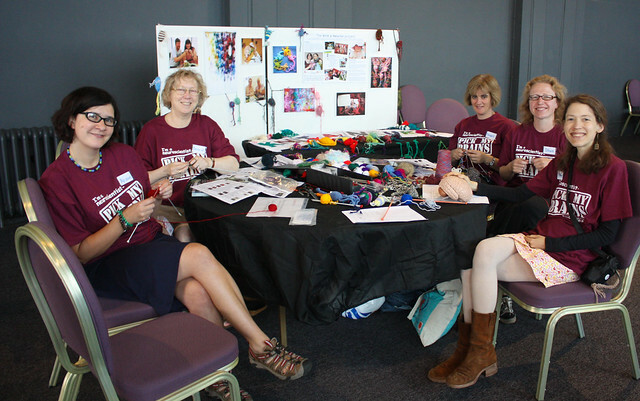 For our New Year Stitch Up we invite anyone new to knitting or new to the group to come along. 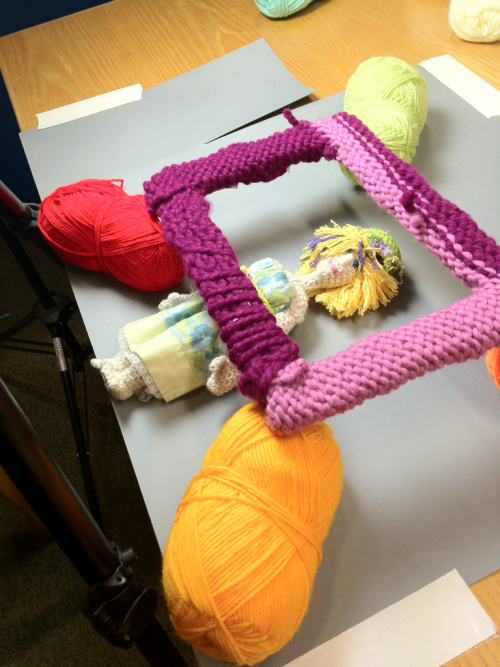 We offer free lessons in knitting basics for learners, which is where is splendiferous Stitch Sages come in. If you know how to knit and think you know enough to pass it on (it’s really very easy), then please join our Stitch Sage team. You only need to teach for about half an hour and then keep an eye on your learner’s in case they get a bit lost while they practice. We really really need new Stitch Sages to pass on the woolly love, so if you want to volunteer in the New Year please drop us an email at stitchsage@stitchLDN.com with the subject “I want to help wrangle the woolly Godzilla”. It’s easy to teach. It gives you that warm fuzzy feeling. It’s a fabulous way to begin the new year. 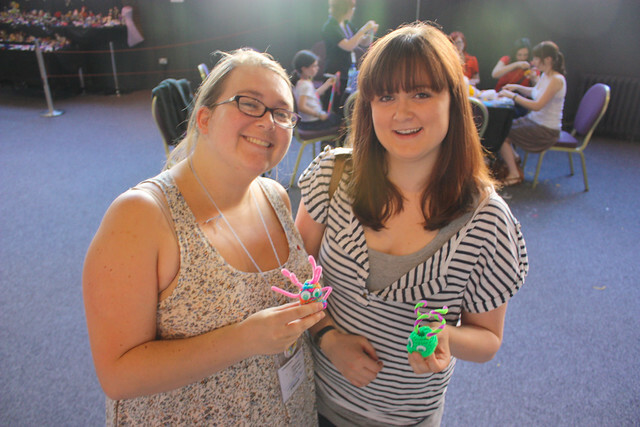 Create a brand new knitter! You can read some of our inspiring Stitch Sage stories here. 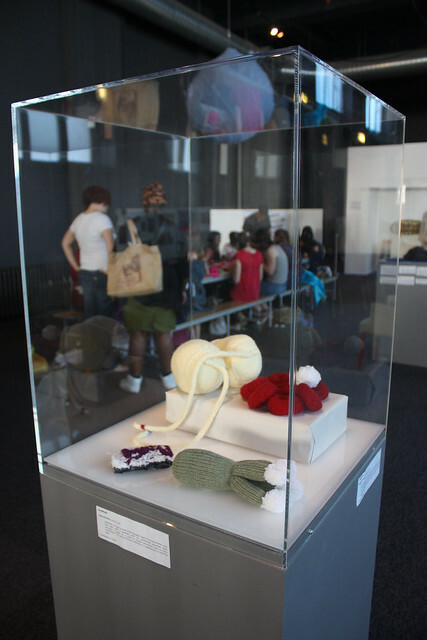 Fancy learning to get your knit on? The New Year Stitch Up is your chance to learn to knit for free! You can bring your own yarn and needles, but Stitch London will be offering Whodunnknit How to Knit Kits in three flavours Sheep ‘n’ Aliens, Floating Flutterguys and Stitched Squid (each perfect for beginners), as well as Whodunnknit Stitched Self Mini Me Knitting Kits for those who know how to knit already. How do I order a Whodunnknit knitting kit? Drop us an email at buystuff@whodunnknit.com and let us know how many kits you would like and which pattern you would like with it. Each kit costs £14. Want to learn crochet instead? 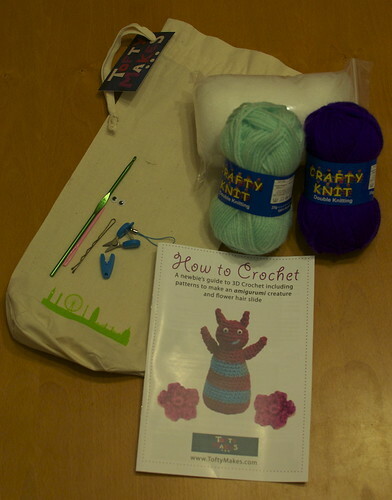 The lovely Tofty Makes will be offering How to Crochet Kits with full instructions in the fabulous full-colour booklet. 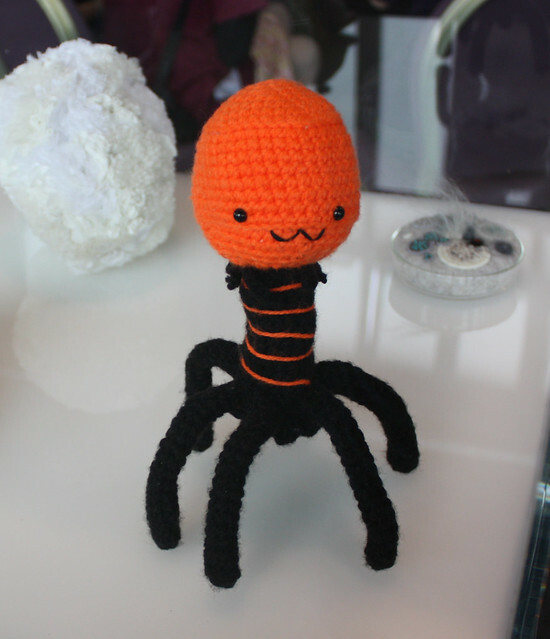 See more about her How to Crochet Kits and the cute amigurmi creature you can make over at Tofty Makes. Drop us an email at buystuff@whodunnknit.com and let us know how many crochet kits you would like and we’ll pass it on to Tofty Makes. Each kit costs £14. See more about the contents here. 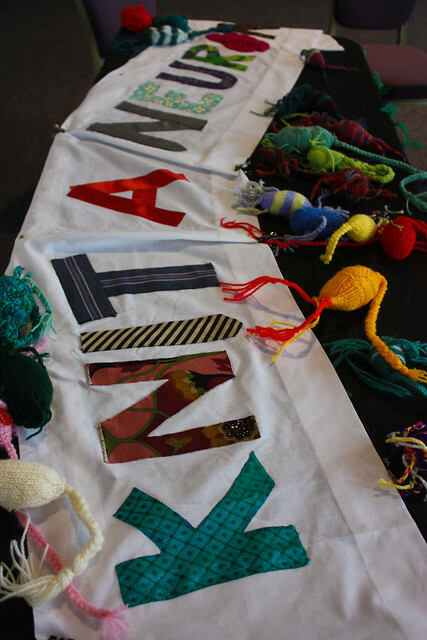 Can anyone come along to the Stitch Up? Anyone and everyone is welcome. 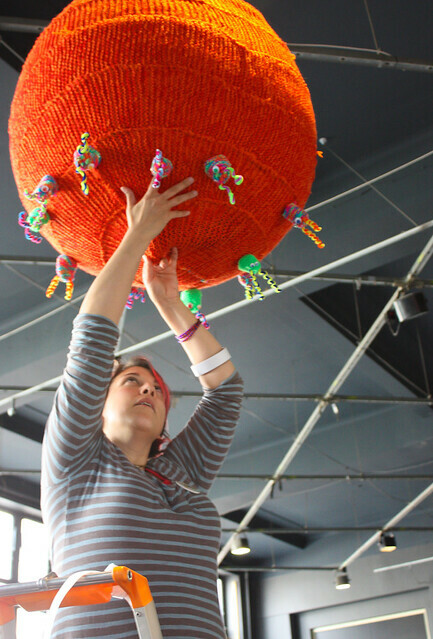 We’re multi-craft, multi-cultural and we love craft as much as you do. 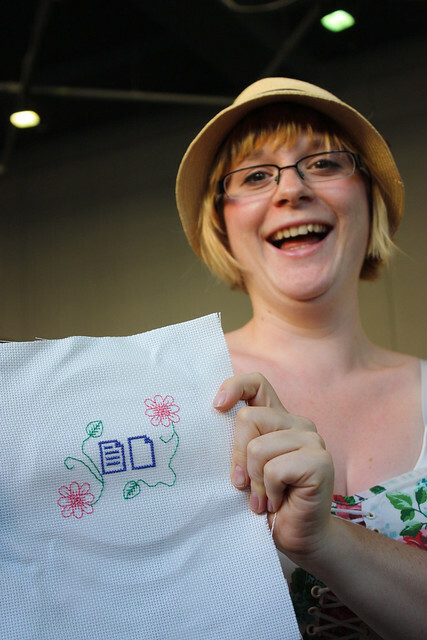 All you need to do is turn up, pull up a chair and start stitching. 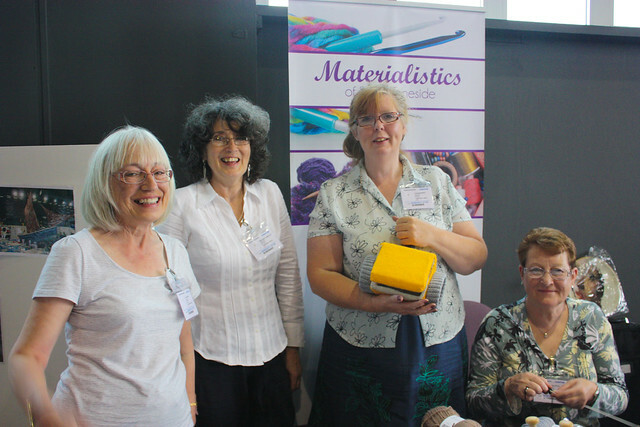 If you crochet, cross stitch, spin, embroider or do any other kind of craft you’re more than welcome to join us. For those who wish to learn to knit you need to sign up when you arrive (look for the New Stitcher Sign Up Sheet) from 6pm. Teaching will begin at 6.30 once most of our Stitch Sages have arrived. It’s all totally free! Woo hoo! Join us on the night! If you can’t make it you can follow us on Twitter and Facebook, where we’ll be posting pictures on the night. See you there and Happy New Year! Wanna win a whole load of Stitch London goodies? Stitch London have been busy designing and making a whole load of Stitch London merchandise for you to show your crafty love to the world. The brand new Stitch London online shop will open in the New Year and we’ll be selling our goodies at the Duckie Christmas Market, but you have the chance to get your grubby paws on the whole lot for FREE! Woo hoo! To celebrate our 6th birthday we’re giving you the chance to win a whole load of Stitch London goodies. All you need to do is come up with the best new idea for a Stitch London badge. How many ideas can I send? Send as many ideas as you like. You can send in three or 30. Up to you. Do they need to be about knitting or can I do any craft? 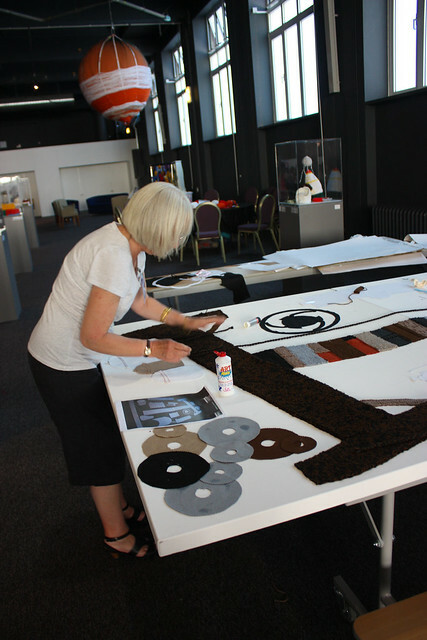 They can be about knitting, crochet, cross stitch, sewing, embroidery or any other kind of stitch or woolly craft. Go wild! What happens if someone else sends in the same idea as me? The first person sending the idea in gets the credit. So get in quick! When is the deadline? 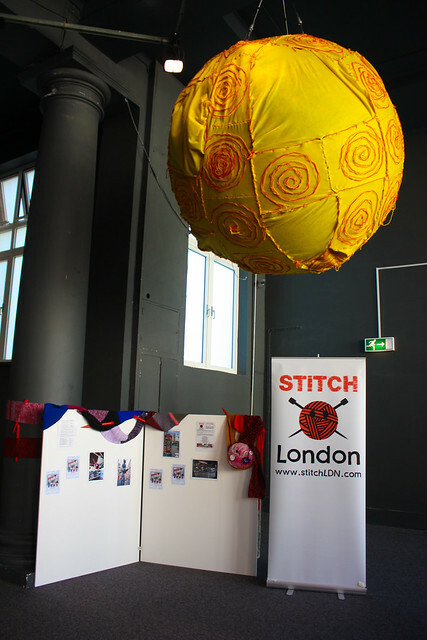 The Badge Factor competition will stay open until Stitch London rehatches mid 2012. Loads of time to think of fabulous ideas. What happens next? In the New Year we’ll put up our 25 favourite ideas to the public vote on our website. The vote will go down to the final 4. The winning badge will win all those goodies and be announced in a newsletter. The three runners up will get prizes too. Your idea might end up on all kinds of Stitch merchandise which means you can proudly tell the world you helped keep the woolly Godzilla stomping and spreading free stitching goodness across the world. So what on earth are you waiting for? Got something punny to say about purling? 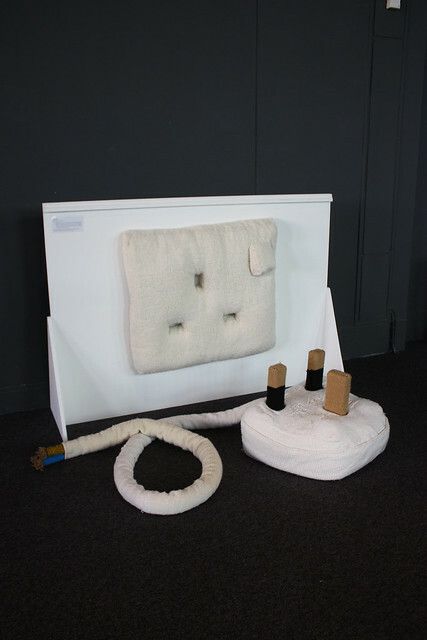 Feeling inspired by the wonder of wool? Have an catchphrase you’d like that lady staring at you knitting on the tube to see? Need to get your needle love out there? 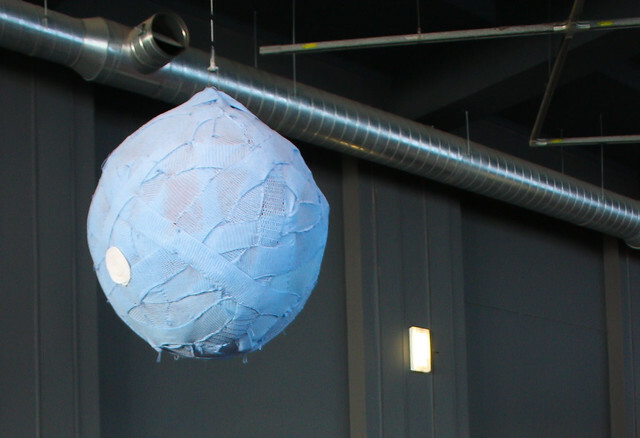 Want to unravel the thread of your thoughts in a public badge-based statement? Cross that there aren’t enough cross stitch saying in the world? Now is your time! 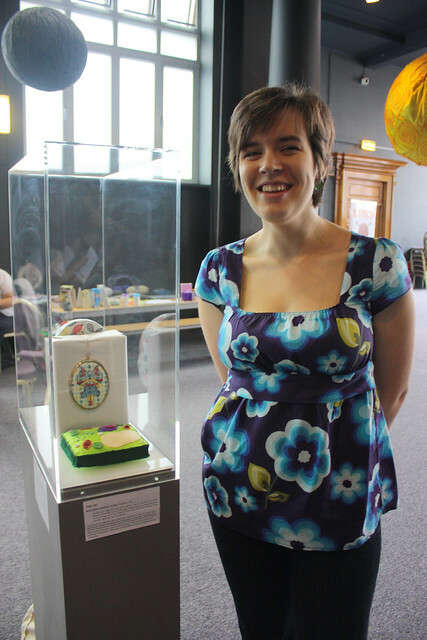 Get your entries in and you could be the Stitch London Badge Factor winner! Yay you! This Christmas some marvellous Stitch Stuff will be on sale at the brilliant Duckie Christmas Market at London’s Barbican Centre. Woo hoo! 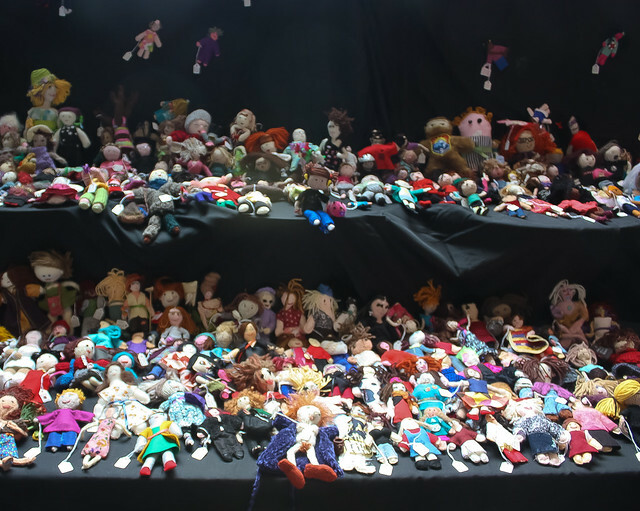 Stitch London proudly presents the woolly might of Stitch London’s creator, Whodunnknit, teaming up with the fabulous Emma ‘The Fastener’ Toft of Tofty Makes to sell a whole load of Stitchy Stuff to the brilliant Duckie Christmas Market at London’s Barbican Centre. What’s Duckie Christmas Market when it’s at home? Duckie Christmas Market will transform the Barbican Centre foyers into an indie gift market showcasing cult crafters, artisans, designers, hawkers, butches, bakers and candlestick makers. It’s a kooky, ultra-fun pop up market and it’s totally free! What are we selling? Beginner knitting kits (including branded Stitch London needles, mini yarn-cutting snips, a how to knit booklet, yarn and other essential bits); beginnner crochet kits (including how to crochet booklet and other essential bits); gorgeous handmade buttons and button-based accessories; over 20 different Stitch London badges; graffiti knitting postcards, greetings cards and prints; Stitch fridge magnets; Stitch London books, and loads more. We’ll have a something special for all members of Stitch London who come along on the 21st. Just say the codewords “Woolly Godzilla”. On December 21st we have an exclusive Stitch London Stitch Up area at the market so come along for our last Stitch Up of the year! Where is it? It’s at London’s Barbican. More info on the venue here. What else is going on? Duckie promises workshops, pop-up performances and seasonal bonhomie. It’s going to be fun with a capital F, we tell you! AGH! I can’t make it! Can I buy Stitch London stuff online?!?!?! The Stitch London shop will be opening in the New Year but Stitch London beginnner knitting kits and Tofty Makes beginner crochet kits will be available at the New Year Newbie Fest on January 3rd 2012. Email mailto:buystuff@stitchLDN.com to order yours. Go on. 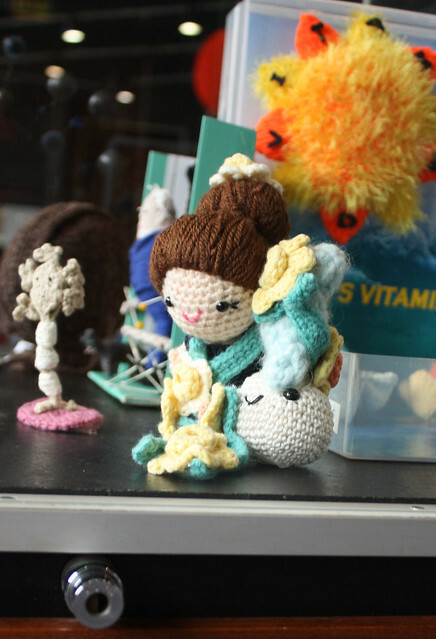 You can also support Stitch London by buying the Stitch London book (with free pigeon knitting kit) or the Knit the City graffiti knitting book. Cool, no? Hark! What’s the noise? Why it’s the knitted reindeer pulling the Stitch London Christmas Shindig Sleigh filled with fantabulous crafty gifts for all! Woo hoo! The Cracking Christmas Raffle means we ask craft sellers to donate their most fabulous things to help raise money for a cause close to Stitch London’s handmade heart. What can I win? We’ll be listing prizes on Twitter, Facebook and our Website. So keep checking as the list grows every day. Where can I get tickets from? Tickets are only available on the night at the Stitch London Christmas Shindig. All you need to do is arrive at the party and buy your tickets. How much are tickets? Tickets will be £1 each and all money raised from the Cracking Christmas Raffle will go to Yes to Life and the Andrea Giles Cancer Charity Appeal. What’s this Secret Santa business about? Stitching Secret Santa is all about giving and more importantly about getting a bit of someone else handsome handmade handwork. Read all about it over at the Stitching Secret Santa post. 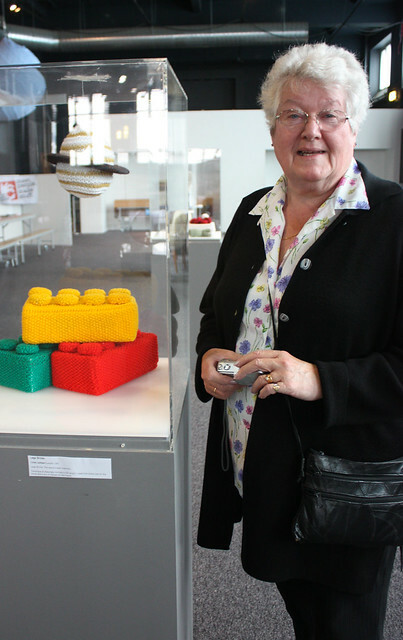 This year we’re raising money to support brand-new knitter Andrea Giles in her battle against breast cancer. Andrea’s fight is more than just a one-woman battle. She began using alternative and complementary therapy when the usual medical route fell short. Andrea is a brave pioneer for the Yes to Life Campaign, setting out to prove that there is hope even when the medical profession aren’t so sure. Andrea’s story is so inspiring we couldn’t fit it all in here, so you can read all about it in a special interview over at the Stitch London blog. It’s an amazing cause and Andrea is an amazing woman. Your raffle money could change the course of cancer treatment and give hope to so many. Please give what you can. And do read Angela’s interview. It really is very inspiring stuff. Can’t make the party? If you miss it there’s the Global Stitching Secret Santa Swap on Ravelry too! Want to donate something? For every item donated you’ll get a tweet to our 6000 followers and a link on our Facebook. 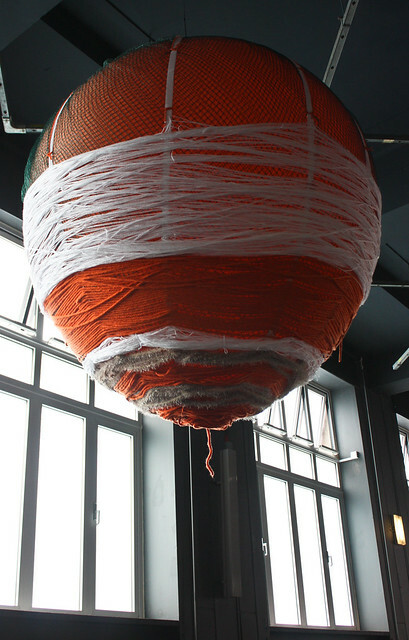 Email info@stitchLDN.com to let us know you’d like to give a prize. Small sellers and large ones are all welcome. This year Stitch London’s Cracking Christmas Raffle will be held at our Stitch London Christmas Shindig on December 13th. This year we’re raising money for a charity which is helping pave the way to giving hope to cancer battlers everywhere. All funds raised will go towards treatment for the amazing Andrea Giles and the Yes to Life Charity. Possibly the worst news anyone can get after an initial cancer diagnosis is that the cancer is unlikely to be cured. And even though medical science is working hard to find cures, these cures are hard on the patients and a terrible risk to their health. It’s a scary world of chemotherapy, radiation and endless medical treatments. But galloping to the rescue are Yes to Life. Yes to Life are charity who are showing there are other ways to help fight, and that there’s hope even when the medical world aren’t so sure. Yes to Life are sneaking up on cancer from a different direction. They help people with cancer in the UK access the benefits of complementary and alternative medicine, they provide support, they help educate the medical profession on other ways to fight, and they work alongside the NHS and the usual treatments to give cancer battlers a fighting chance. This year Stitch London have chosen to help raise funds for Andrea Giles. Andrea’s story is an inspiring one. She’s battling breast cancer in the face of a grim diagnosis from doctors; she’s becoming a pioneer for a new way of treating cancer; she’s telling the tale as she goes to inspire others; and, a happy coincidence, she’s also learning to knit. Raising money for Andrea’s treatment is doing so much more than helping this inspiring person to keep on fighting. It will help fund a much-needed charity and prove that these treatments can make a huge difference, which means giving new hope to cancer fighters everywhere. Andrea’s story is so fascinating we thought it would be best to ask her a few questions and let the lady herself tell her tale. Wow, that’s a difficult one… A woman in search of herself, perhaps! Though I’ve never lost my funny bone ha! ha! You are currently battling Metastatic Breast Cancer with a combination of complimentary therapy and carrot sticks. Your website says you have had chemo and radiotherapy before. Why the change? Why the unconventional methods? I had chemo and radiotherapy after my first diagnosis in 2007; though I did have a 5-day course of Radiotherapy after the 2nd diagnosis (October 2009) to help with pain relief to my left shoulder (which it did do – ease the pain I mean!). Doctors said no chemo this time as wouldn’t work due to type of cancer – palliative care only in the form of different drugs…. a) monthly implant to switch off my hormones and keep me switched off – cancer is hormone fed (had new implant every month), b) infusion of Bisphosphonates every month (bone-building drugs) and c) letrazol – a drug that blocks the process of aromatisation, and so reduces the amount of oestrogen in the body. I started these treatments in November 2009 but decided to stop them all in August of this year because for a long while I had not been happy about using chemicals to treat my condition. Especially when some of the drugs had side effects that were detrimental to my condition! Also since changing my diet to that of raw food and changing my lifestyle to a more holistic one, the conventional medicine no longer fitted with my changing beliefs. The carrot sticks spoke to me. Ahhhhh cake, if only! On a conventional raw food diet you can have your cake and eat it, albeit raw cake, which by the way is amazing. However I am not eating any sweet stuff at the mo, including no fruit, as cancer cells like to eat glucose. They like it very much and take it up quicker than normal cells. So by stopping eating any sweet food that the cancer cells like, you are starving it, ha! ha! Hot dinners…….. well until very recently I was 100% raw food, but since having a couple of consultations with a natural nutritionist I was advised to introduce some very simple warm food into my diet to be gentle on my liver. The liver is the organ of the body that holds on to lots of toxins as well as tries to clear them out, and so need a lot of care to get it back to full working order after all them damage that will have been done to it through conventional medicines and ‘bad food’ choices over the years. Too much info to explain here really. So for now I am having very simple warm food occasionally (nothing fried – oils become denatured through frying!) Feels odd though to be eating hot food again as I don’t quite feel as if I’m getting optimum nutrients, but I know that what I am doing by eating some warm stuff is being gentle to my system. I still eat a very high raw food diet though. And yes I do miss cake – maybe one day I’ll have a slice of raw cheesecake again. If you think any of your readers might be interested in trying raw food there are 3 places in London that have good selections. Inspiral Lounge in Camden – they make the most amazing raw ice-cream too (no dairy in sight), Vantra on Soho Square (organic and buffet style), and Saf Restaurant – a gourmet vegan restaurant – fabulous food. And here in Brighton too there is a fantastic restaurant and café called Aloka – their raw food is the best I’ve ever had. Has having cancer changed the way you live your life in good ways as well as the expected bad ones? Cancer has changed my life in so many ways, but above anything else it forced me to think about where I was going with my life – the jury’s still out on that one, hence my description of myself as a woman in search of herself! Having chosen to change my life by going to university and take myself off in a certain direction, cancer came along and knocked me off that planned path. But in doing so it has forced me to face myself more clearly and more openly. Though this has taken time and is still on going. To question the way I think and feel about myself and others and the wider world and our place within it and how we conduct ourselves whilst on this planet; our relationship to each other and all living beings and the impact this has. I have found I have questioned myself a lot; who am I, what is my purpose etc. Also I have a new and improved outlook on life, as I enjoy the beauty in small things more; a child whizzing down a street on a scooter, the sound of the wind through the trees, seeing happy faces and hearing laughter. I feel so glad that I am still here and a part of life as I have so much to be thankful for. Also I have met and continue to meet so many amazing people; people who genuinely care for others, who delight in others delight, who support without judgement, who want the best for others without pressure; very inspiring people who I look up too and aspire to being like. treatment. How do you stay so positive? Sometimes I do have down days or off periods when things pile up on you (like the dishes!!!) but look out of the window; it’s sunny, everyone is smiling, you can go for a walk, the birds are singing, the colours are bright, or it’s misty, how magical does that feel, conjures up fairytale stories, moisture settles on cobwebs and how beautiful do they look, or it’s raining, kids are splashing in puddles, it’s great to get togged up in waterproofs and feel the power of the rain, or it’s windy and what a laugh that is as it blows through you and around you. It’s about perception really, and enjoying the things that make you and others feel good. When you feel good it ripples out to others and is reciprocated. I think I do generally have a positive outlook on life as a friend once commented (and I’m not blowing my own trumpet here – I don’t have a trumpet actually, but this is what she said to me) that she always liked talking with me because I would always find a positive when presented with a negative. So I guess that’s what I do, though I think it’s just how I am, but I’m not Pollyanna, just like to try and be upbeat. You kept your diagnosis quiet for quite some time but have recently started a blog on your website. What made you choose to share your tale with others? I guess in the past I didn’t want to be seen as ‘Andrea…..Cancer woman’ as if the cancer would be the way people saw and related to me. I wasn’t sure about the funding/website thing because it meant having to bear my soul to everyone and I didn’t know how I would react to having to do that. I was fearful of doing it, but strangely enough I have felt it to be very liberating as though I didn’t realise it til I’d done it. I had been putting myself under a lot of stress by hiding my diagnosis as it meant struggling with things that I needn’t have had to if others had known, and also not being able to talk freely with others because of my need to feel protective of them; protecting others from news that might be difficult for them to deal with and respond to. Now my truth is out there (or rather my cancer truth is out there) and I am free of carrying it all on my own, and if others find it difficult to deal with or talk about that is for them to sort out for themselves. I can understand some may find it difficult but we all have to be responsible for ourselves and our thoughts. By my sharing my story with others I am taking responsibility and ownership of this part of myself and acknowledging it to be valid. By letting people know of the alternative treatments I am having I was hoping it would give those who read it an insight into other treatments that are available should they wish to explore further. I didn’t realise I would get such an interested response, such as your enquiries, and I am rather overwhelmed that you think I could be a positive role model in this, however if it allows more people a way into discovering more about these forms of treatment than I am more than happy if my story inspires! What do your friends and family think of the new treatment idea? Ah, this is an interesting one. Everyone is supportive in their way, however some responses have been tinged with the….. ‘ well, I guess if you think it’s going to work that’s good, but I don’t know if I could do it’ In other words they would have stuck with the orthodox route, whilst others who, from the conversations I have had with them, are more enlightened about alternative treatments have not put any ‘buts’ in the sentence and have been really enthusiastic about my choice. You lost the use of one arm due to metastatic breast cancer moving into your bone, but radiotherapy and your alternative route means you returned to cycling, hiking and doing yoga. Are the doctors amazed at your success so far? I did lose the use of my left arm due to my metastatic breast cancer in the bone, and the use slowly returned after having Radiotherapy to the left shoulder blade, the site of the biggest cancer cell location and the cause of the pain. The cycling etc I was able to do before changing recently to my current therapies. That said however, I strongly believe that my diet change helped immensely (and continues to help) in my recovery and energy levels and general well-being. The doctors have always been pleased with my progress, but they are a reticent bunch when it comes to showing overt enthusiasm for anything other than the orthodox. Your treatment started on November 7th and will continue for the next three months. Treatment for most cancer fighters consists of chilly disinfectant-smelling rooms and bad hospital food. What’s the centre in Brighton like? The clinic in Brighton (Vision of Hope) is very homely and cosy. What was once a large Edwardian semi-detached residence is now a space of healing, and there is definitely no smell of nasty disinfectant! The Doctor and his assistant are 100% attentive and personable. I feel more like I am away at relatives, in as much that almost everything is done for you, though of course none of my relatives ever stuck a needle in my arm! The room that you have the hyperthermia and ozone treatment in would be classed as the conservatory if being used in a domestic setting, which is lovely as it overlooks the garden, and each patient has that space to themselves for their length of treatment. The Vitamin C room can take up to five patients, and is more like a reception room. We lounge in padded directors chairs with hot-water bottles, blankets and music of our choice and rest or chat as we infuse the Vitamin C. Everything has an air of calm, even the décor. I am staying in one of the two flats available above the clinic and this is a blessing as it makes everything so much more manageable and less stressful. For me the small and personal is the perfect choice as it is so unlike a hospital environment. Plus I have buzzy Brighton just down the hill which has one of the best health food shops I’ve ever been to and believe me I’ve been to loads (in fact in case you didn’t know, I used to be the co-owner of one! – we were pretty amazing too, but we didn’t have the space to sell organic veg! which this one does). What kind of treatments are you having? Are they very different from chemo and radiotherapy? The ‘Back to Wellness’ page on my website explains all my treatment or you can look at Vision of Hope for even more detail of the treatments. Rumour has it you’ve got yourself some knitting needles. 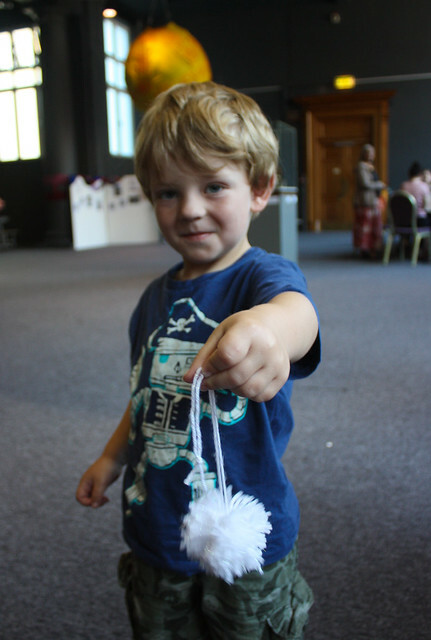 Do you have ideas of the kind of things you’d like to make or will you just see where the yarn takes you? I am doing the typical Aunty thing and experimenting with my nieces and nephew in mind. For the girls I am knitting a little cowl type scarf with a pom-pom on one end, and for my nephew he gets a multi-coloured, possibly two stitch type scarf! Ultimately I would like to knit myself some funky jumpers and stripy socks, but I think that’s a long- way off yet! By the way one scarf is almost ready – I just have the pom-pom to make and attach. I may send you a photo if you’re lucky! Do you have any advice you’d like to pass on to other cancer fighters or their families and friends who may not know where to start when looking into complementary and alternative therapies? A very good place to start and one I wish i’d known about long ago, is the charity YES TO LIFE. As their tag-line states, their centre offers ‘support and information on all aspects of complementary and alternative cancer therapies’. Both offer invaluable advice and are excellent sources of information. They take the struggle of doing multiple google searches and having too much to deal with. They listen and offer advice based upon what you are looking for and can offer more besides to give you wider informed choices. Thanks so much for taking the time to answer our questions. We wish you all the best and will be keeping up with your blog to see how it goes. Stitch London sends you woolly hugs and hopes the donation we make from our Cracking Christmas Raffle will help you and everyone else battling cancer to triumph. 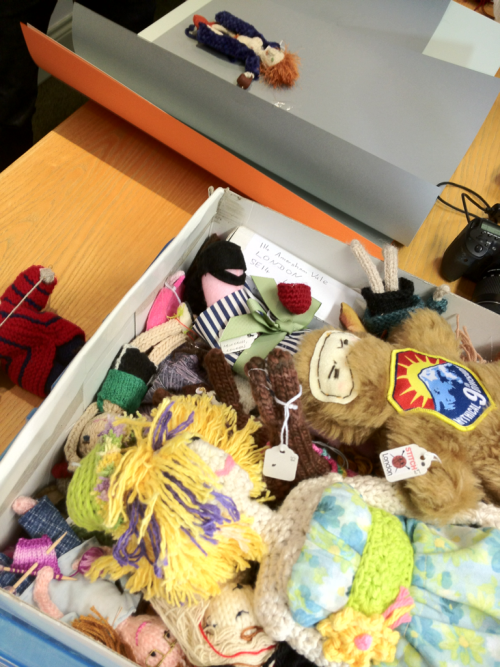 Stitching Secret Santa goes Global! There’s the jingle in the air. EEK! Christmas is acomin’ and there’s soooo much stitching to do. This year we’re holding our annual Stitching Secret Santa at our Stitch London Christmas Shindig. But since there are now Stitch Londoners in 52 countries around the world we know some of you won’t be able to make the party. So we’ve decided to start a global Stitching Secret Santa Swap on Ravelry. It will be announced in the next newsletter with a link to this thread. Squeeeeeeeeeeeee! Christmas! Mind you remember to come back here and show us what you go afterwards or we’ll sulk! Stitch London goes global for Christmas. Ain’t it grand? If you knit or spin chances are you’ll already be counting the hours until Knit Nation 2011 kicks off. If you have no idea what Knit Nation is then where on earth have you been? There marketplace has many of Stitch London’s fibre-flogging pals too: Anova Books, Artisan Yarns, Atomic Knitting, Blacker Designs & Yarns, Brownberry Yarns, Cocoknits, Debonnaire, Easyknits, GMC Publishing, Great British Yarns, Habu Textiles, Jeanette Sloan, John Arbon Textiles, Juno Fibre Arts, Knitting Magazine, Krafty Koala, Loop Knitting, NicsKnots, Nimu, Old Maiden Aunt, Purl Alpaca Designs, Renaissance Dyeing, Skein Queen, Sparkleduck, StitchMastery Knitting Software, Susan Crawford Vintage, Sweet Clement, Tall Yarns’n’Tales, Toft Alpaca Shop, The Bothered Owl, The Little Knitting Company, The Natural Dye Studio, The Yarn Yard, Tilly Flop Designs, Twisted Angle, Well Manor Farm, Woolly Wormhead, Yarn Box and Ysolda. And if that isn’t enough there’s a Knit-Tea Salon, a film screening and a wild and woolly Charity Bingo Party on Saturday night to raise funds for Refuge. Our friends at p/hop will be there too raising money for MSF with their fabulous patterns. 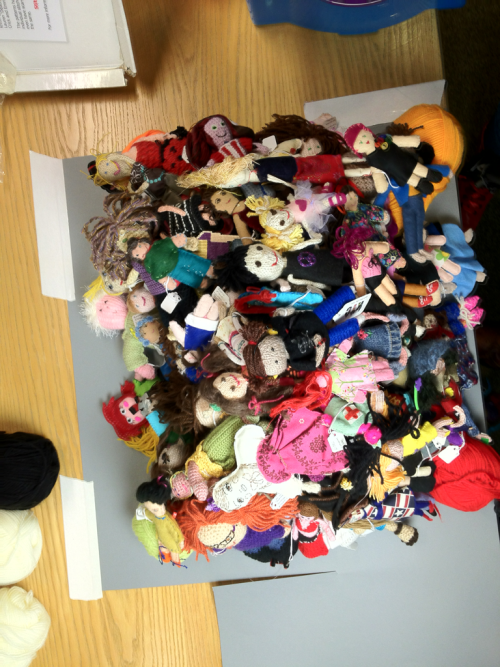 That’s a whole lot of woolly wonder in one place. Hurrah! See you there, Stitch Londoners! The woolly eagle has landed! 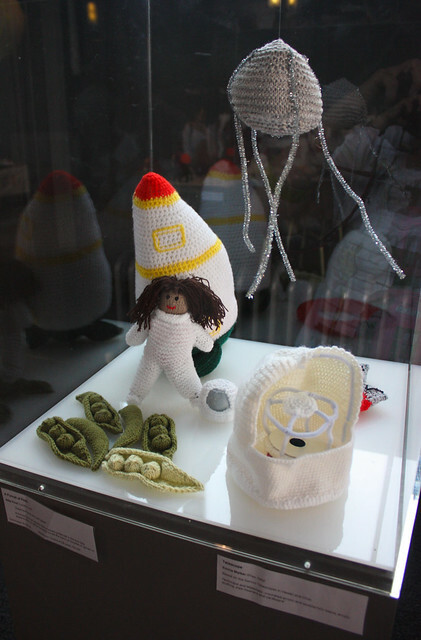 Stitched Science at London’s Science Museum blasted off last weekend and brought a galaxy of woolly stars with it. 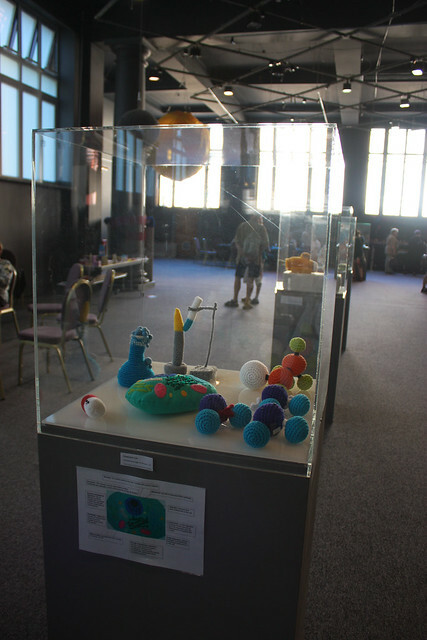 There was a giant Stitched Solar System, over 250 Stitched Self handmade mini mes, over 60 Stitched Science Specimens sent in from around the globe, and eight cosmic crafty workshops areas teaching everything from Martian making to knitting planets from plastic bags. 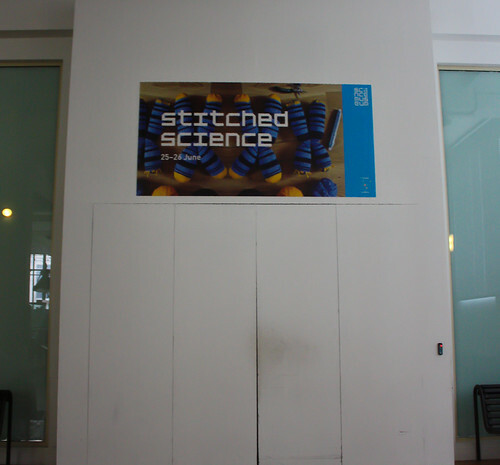 We have Stitched Science lift off! 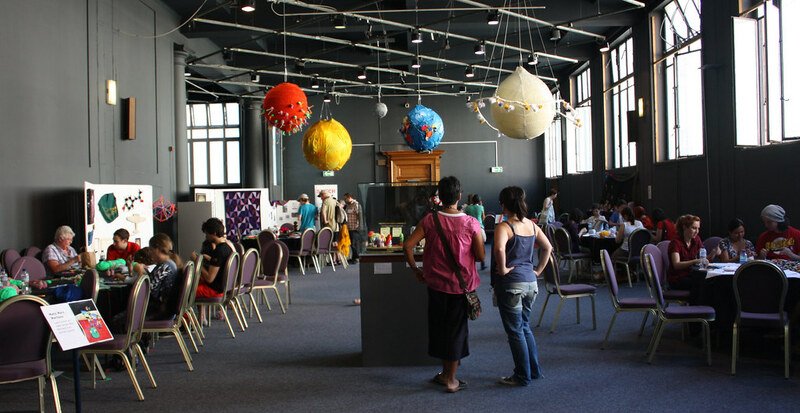 When Stitched Science was dreamed up and we were shown the space there was to fill, I decided ‘space’ was certainly the word for it. The only thing to do would be to fill it with something sciencey and giant, and what’s more giant than the solar system we’re currently floating about in? 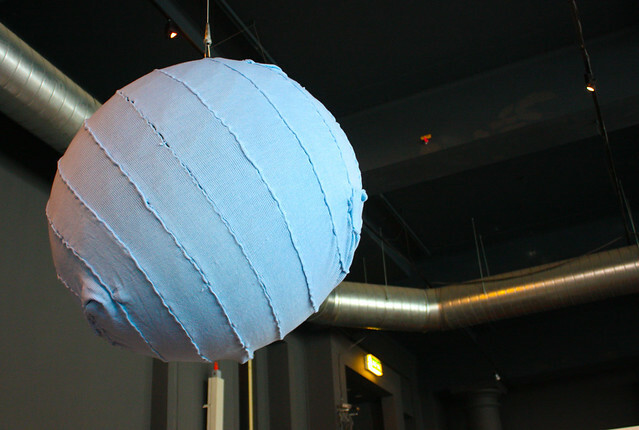 Our sun was over two metres wide and covered in over 8 metres of handsewn felt. 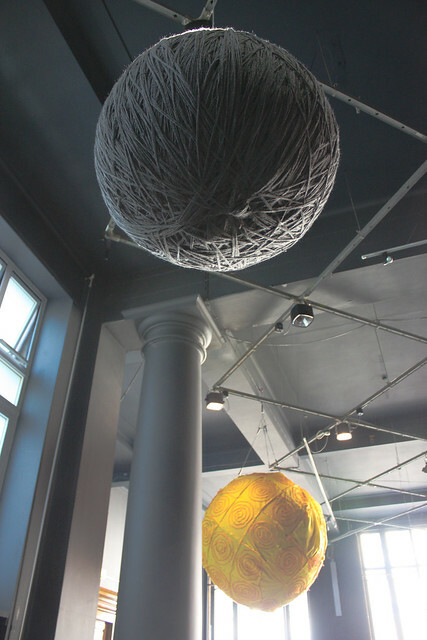 Tiny Mercury was wrapped in yarn to make a giant ball of wool in grey Mercury colours. AGH! 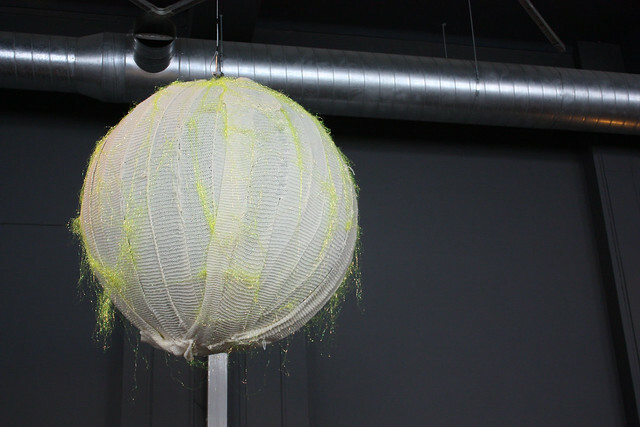 A giant ball of yarn! 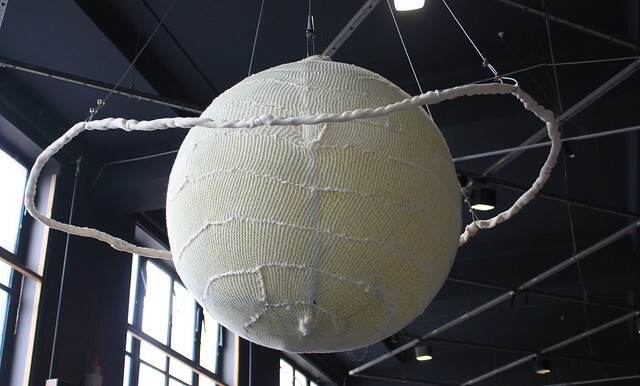 Venus was rolled in handknitted strips and sprinkled with real poisonous gas (honest). Cough! Cough! The poison gas! 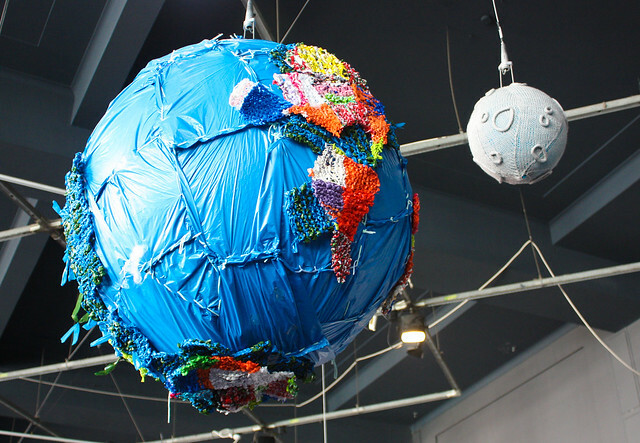 Earth was fashioned from many, many plastic bags with plarn (plastic bag yarn) knitted up and shaped into the continents. The moon was handknitted too. Whee! The planet is ours! 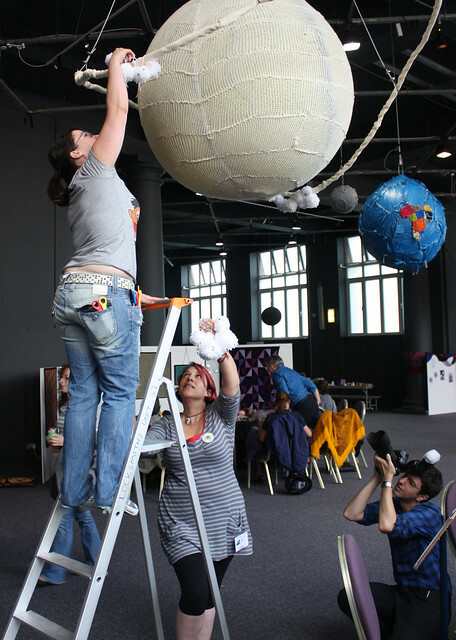 Jupiter went up half-finished and it was up to our knitting jenny cord makers to complete it. Saturn was surrounded by a bare-naked ring ready to be filled up with pom poms to form its icy particles. 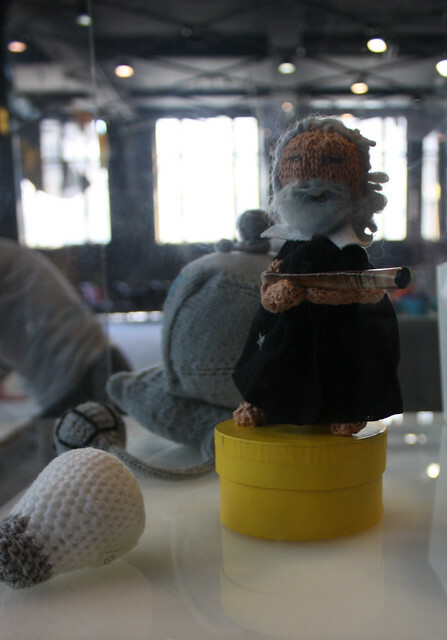 Uranus (snicker) was conjured up on a knitting machine and then handsewn into a swirly shape. The rudest planet there is. Poor thing. 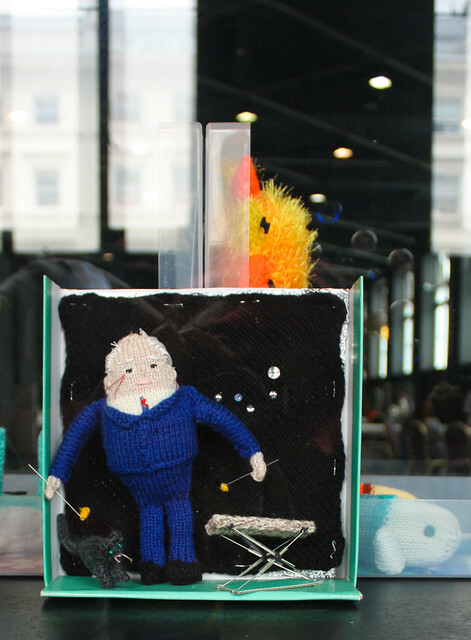 Neptune was made up of some crazy handknitting and featured a white spot just like the real thing. Have I got a spot coming up? 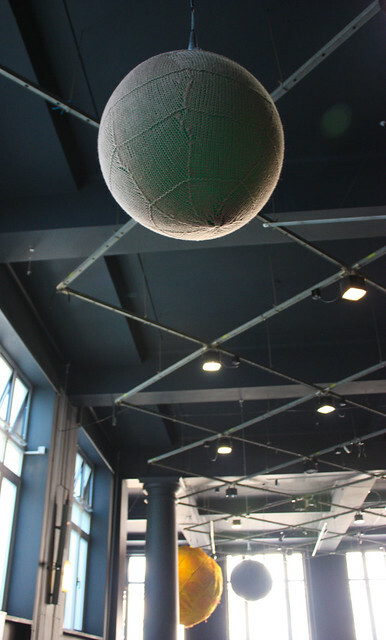 And because we didn’t want to leave him out here’s Pluto, the almost-planet. He was knit by hand in the round with a few purly rows thrown in for decoration. I am a planet! Dammit! Finished travelling the Solar System? We’ve got lots more to share! 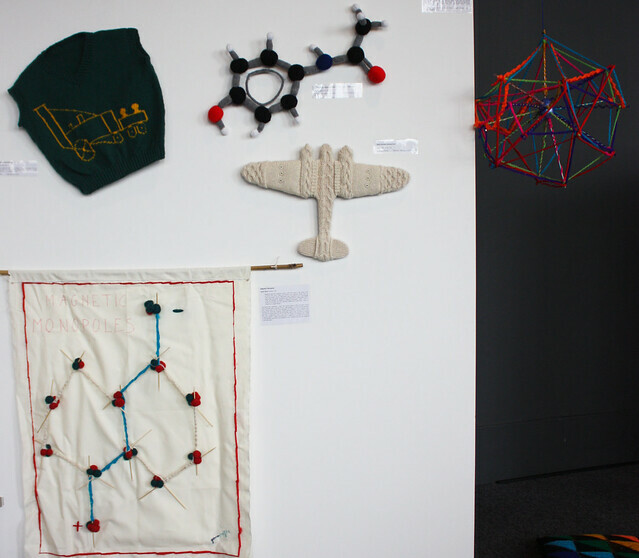 Over the past couple of months people have been sending in Stitched Science Specimens from all over the UK and the globe. 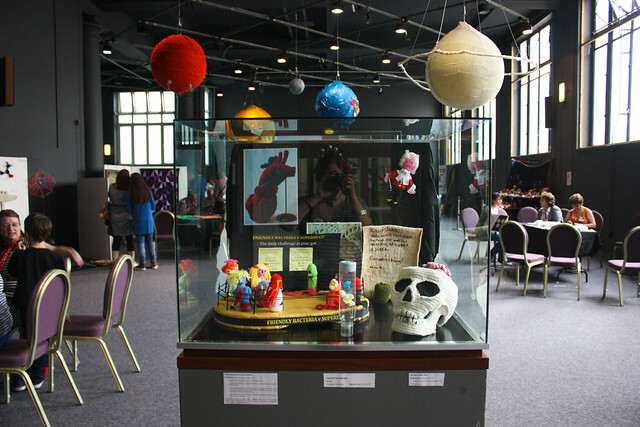 We wanted to make sure they were treated with the proper respect they deserved so we tucked each of them safely into official Science Museum showcases for the event. 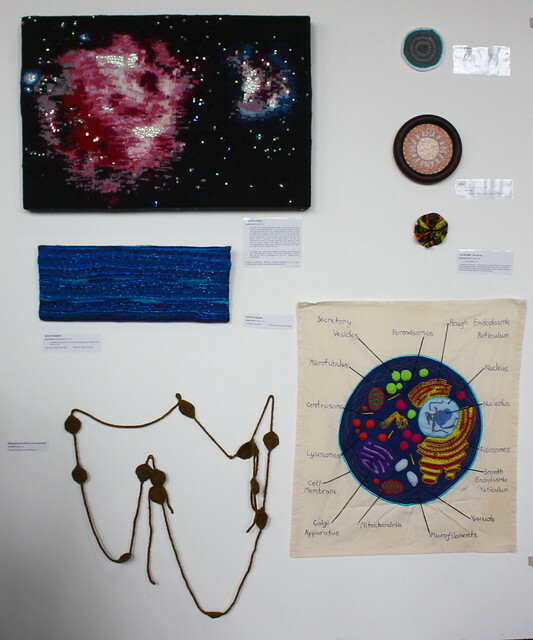 There were 64 Stitched Specimens in total and they were all absolutely astoundingly brilliant. We’ll blog them in more detail later on but here’s a view of a few. We had some science celebs in too. 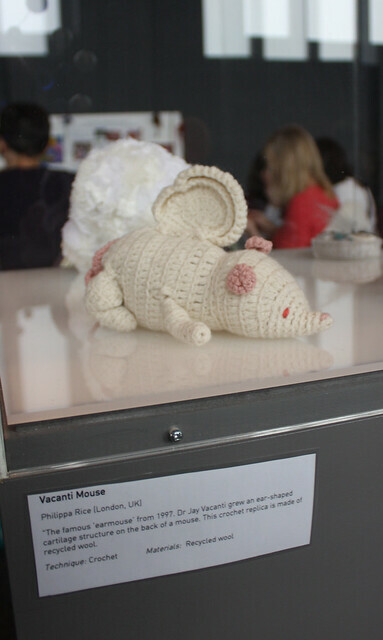 Vacanti's Earmouse! Ewwwww and yet awwwwwwww! 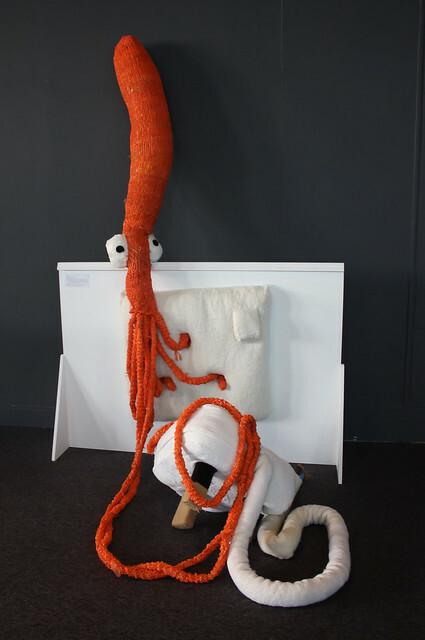 and who could forget Plarchie, the handknitted squid? And we weren’t alone in our cosmic craft! 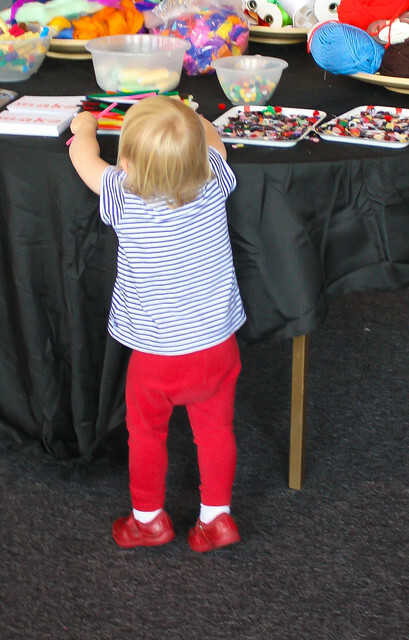 We had crafty friends there too. Wizard! Ain't that young Harry Potter?!?! 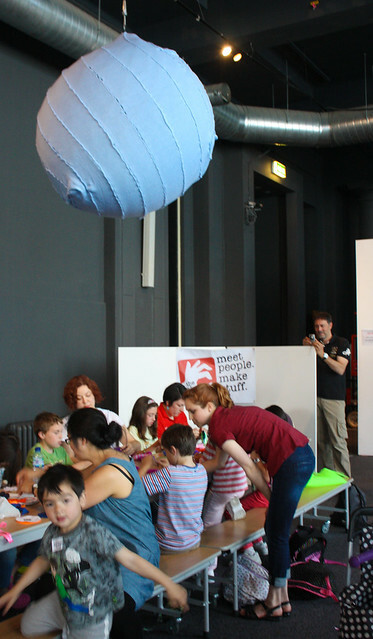 and The Make Lounge went monster mad! Aaaaaaand that wasn’t all. 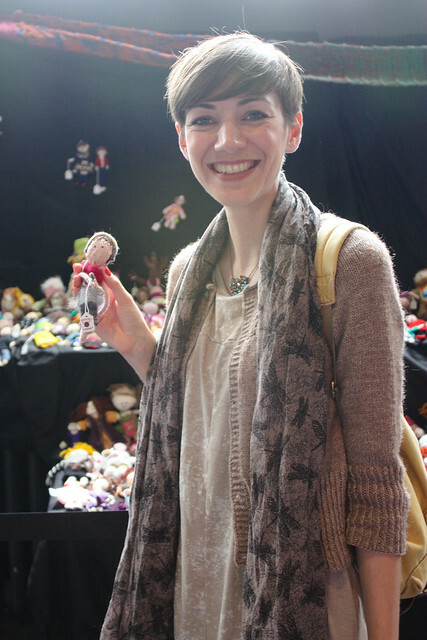 Your 255 Stitched Self handmade mini me were there too! Plarchie meeting the plug: fried calamari for all! And we met some of the makers too. 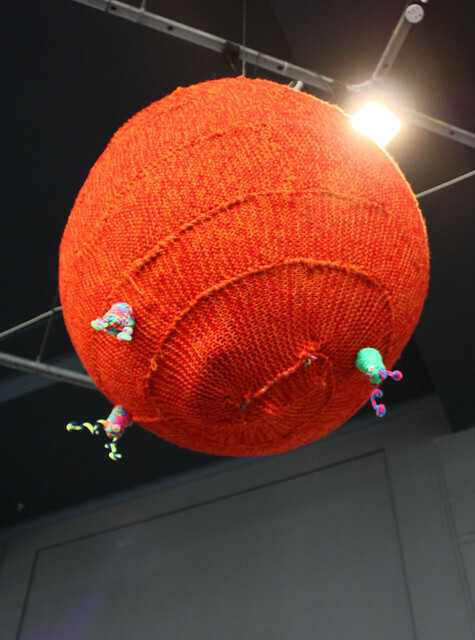 When it was all over our Solar System was mostly stitched, the Martians had totally taken over Mars and a cosmic crafty time had been had by all. Phew! 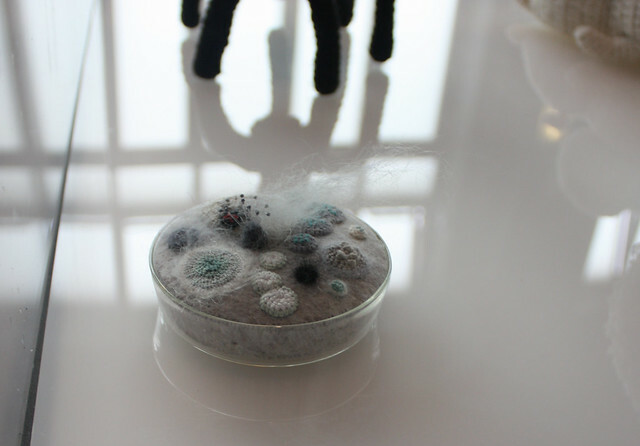 If you missed out there are more pics over at Stitch London’s Stitched Science set. Even more pics over at Stitch London’s Stitch Up. 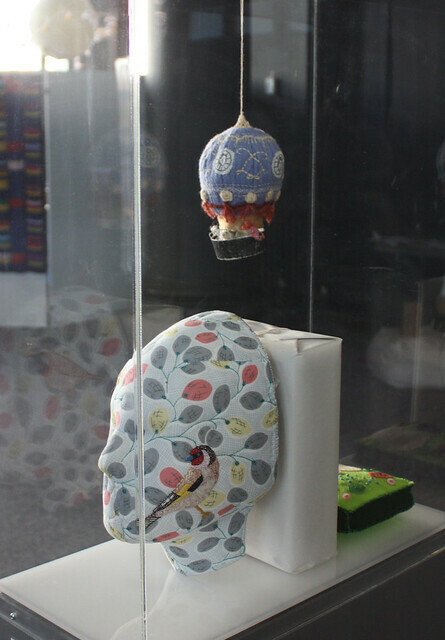 And we’ll be blogging each of the Stitched Specimen’s close up and in detail very soon. Plus you can purchase the Manic Mars Martian knitting pattern for a bargain price over at Whodunnknit. All profits go towards keeping Stitch London running free events like this one. Yay! 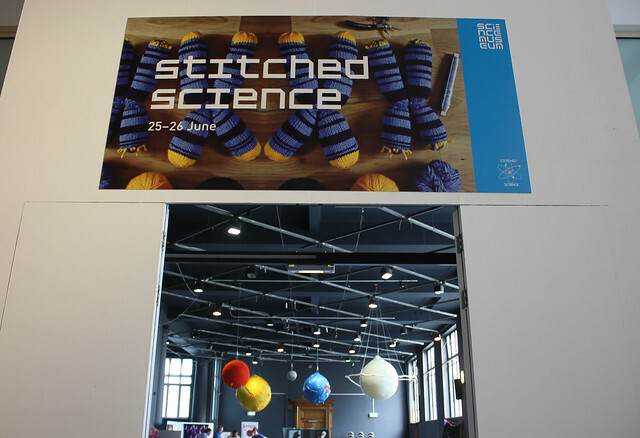 Thanks to everyone who came along and made Stitched Science so spectacular. 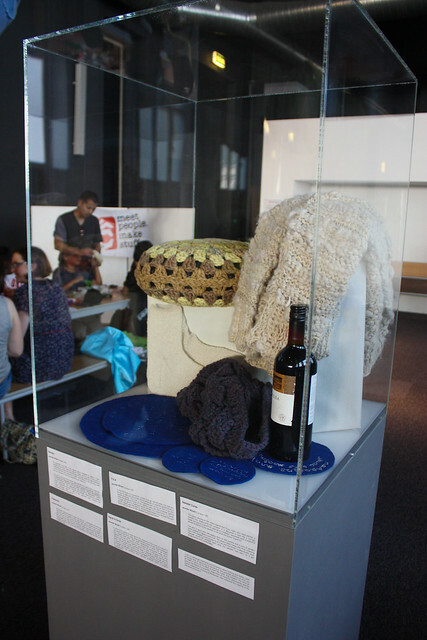 Huge thanks to: Sue, Caroline and Katrina from the Science Museum for allowing us to run riot with our yarn. 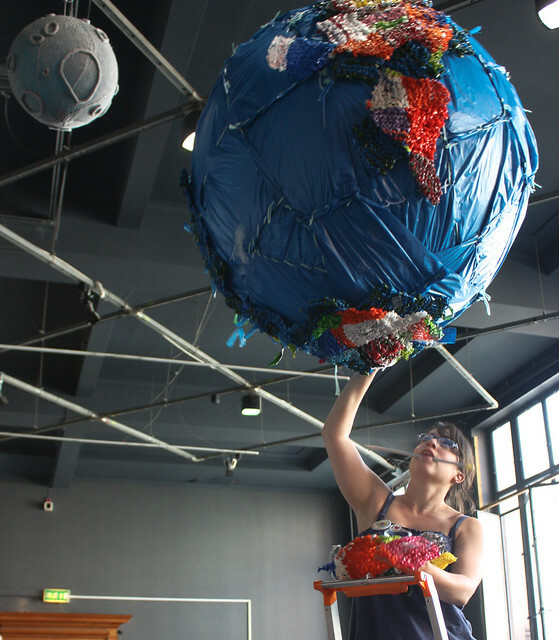 More huge thanks to: Gary, Emma, Sarah and Jenny for Planet Wrangling and heavy-lifting above the call of duty. More huge thanks to our Stitch Sage Stars: Maria, Monique, Frederica, Madelaine, Lisa, Stephanie, Linda, Genevieve, Honey-Lee, Lucy, Amy, Kate, Brigitte, Miriam, Anna, Virginia, Clare, Beryl, Amy, Suzanne, Nicola, Emma and Mary. 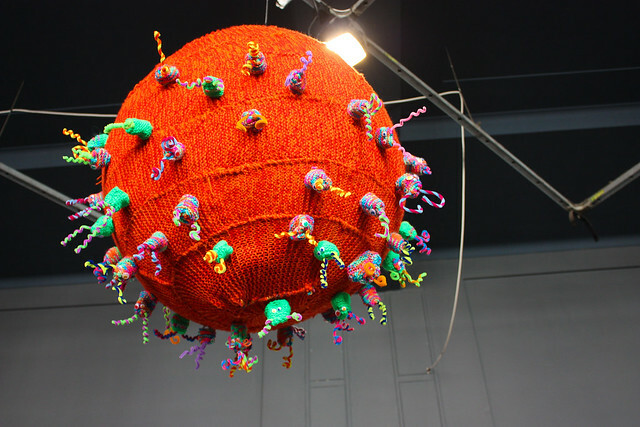 Even more huge thanks to our Planet Knitters: Clare Tovey, Ellen Lindner, Linda Laidlaw, Suzanne Strachan, Emmy Harrup, Penny Gregory, Ann-Marie Thondrayen, Amy Shannon, Jaqui Lund, Alex Lawson, Abby Pond, Beryl Scott, Maria-Jesus Rojo, Frances Lee, Sarah Kerry, Madelaine Emberton, Nicola Cockett, Lina, Janet Baker, Sandra Ong, Karen Laidlaw, Rite Hoyle (4 rows), Jenny Willett, Emma Walker and Brigitte Onyskiw. A tad more thanks to: Thomas B. Ramsden for bargain emergency extra yarn and tinsel planet gas.